Ireland is known as “the land of the horse”. There are three breeds of horse indigenous to the island of Ireland: The Irish draft, the Irish hunter, and the Connemara Pony. 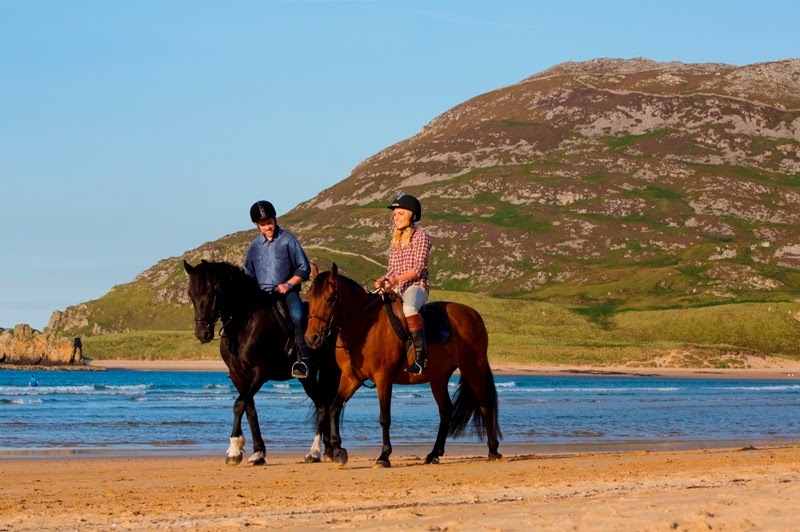 Inishowen boasts some of the best riding experiences a horse enthusiast could wish for. There is no better place to take to the hills, and reconnect with a bygone age. As the season begins, embark on a journey with a four-legged friend. There is an old saying that goes “there is no bond so close as that between a man and his horse”- and nowhere is this bond more treasured than within the InishowenPeninsula. Enthusiasts can enjoy a tailor- made weekend, to suit their competence level; from first time novices to the more experienced rider. At a summer camp, children can enjoy fun and activities, wholesome food, and comfortable accommodation after bedding down their four-legged friends. With four main locations specialising in equestrian pursuits at Muff, Moville (registered Riding for the Disabled), Malin and Clonmany you are sure of getting a wide variety of Horse Riding Activities and facilities. Choose to chill, meandering along trails that will take you through the most breathtaking scenery, or, some intensive training on specially-built cross-country courses. The choice is all yours. 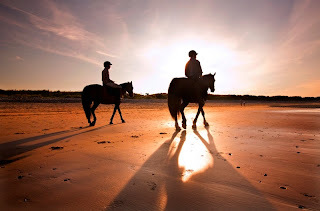 Experience a union of souls in a very special relationship that brings horse and rider together; share the thrill of galloping along the sand in the most northerly point of Ireland. The Atlantic Ocean sea spray on your skin and the open sky above sets the scene for a holiday experience like no other. Saddle up and explore some of Inishowens’s wildest coastal landscapes on horseback. Many of the visitors to Inishowen have described the experience of riding a horse along the wildness of the Atlantic Ocean as the, “experience of a lifetime”, something that is on many people’s “bucket list”. One visitor stated “riding along a 2km beach, I could clearly see Malin Head, being on horseback gave it an added dimension. Feeling comfortable and safe - I was perfectly content to just walk - being on the beach, breathing in the sea air on horseback, enjoying the scenery = a slice of heaven”. Another visitor recalled, “the constant rhythm of horses hooves, friendly chat, storytelling from our guide and fellow riders made it an ideal way to escape the headache of the modern world for a couple of hours”.